As we dive into our caterpillar and butterfly learning theme, we are reading lots of books to get us familiarized with the life cycle of a butterfly. Of course The Very Hungry Caterpillar by Eric Carle remains a favorite, but we have really enjoyed the vibrant illustrations of Lois Ehlert’s Waiting for Wings. 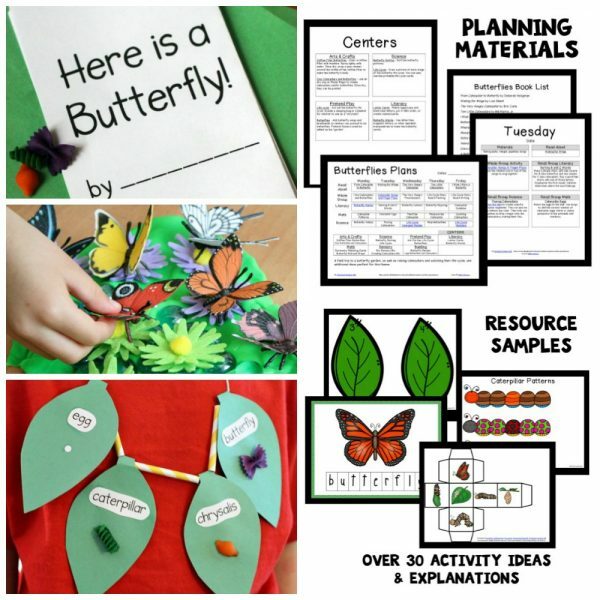 The simple rhyming text teaches all about the life cycle of a butterfly and even how to plant your own butterfly garden! 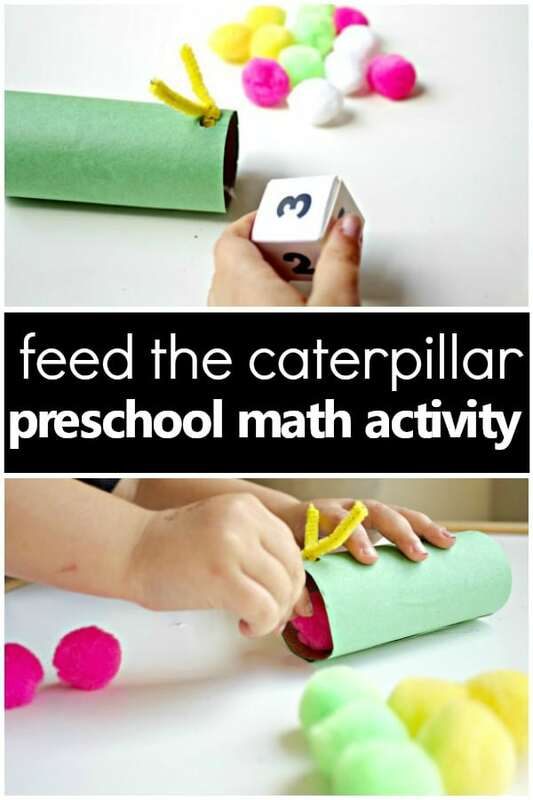 For a fun learning extension to the text, we created caterpillars out of recycled cardboard tubes so that we could “feed” them and practice some early math skills at the same time. 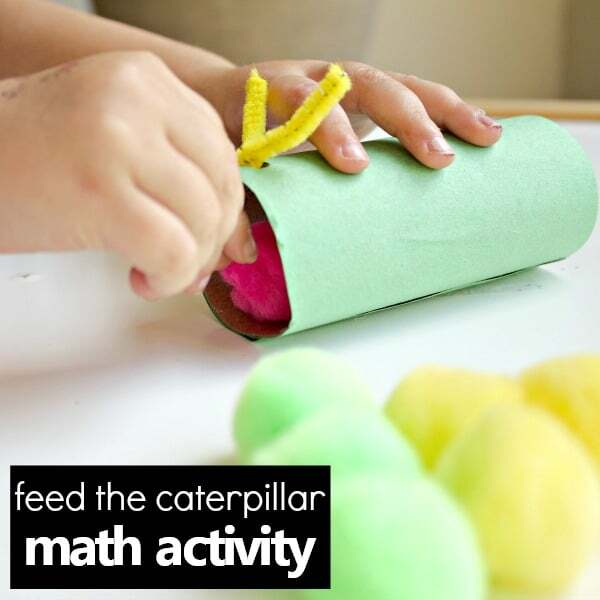 This feed the caterpillar spring math activity provides a hands-on way to get children practicing one-to-on correspondence, number recognition, and counting. 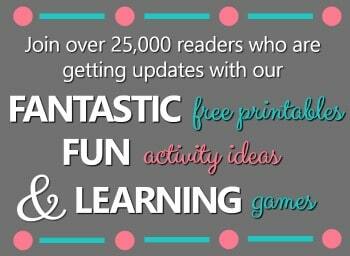 FIND EVEN MORE SPRING THEME ACTIVITIES IN OUR PRINTABLE SPRING LESSON PLANS AND OUR BUTTERFLY THEME LESSON PLANS. 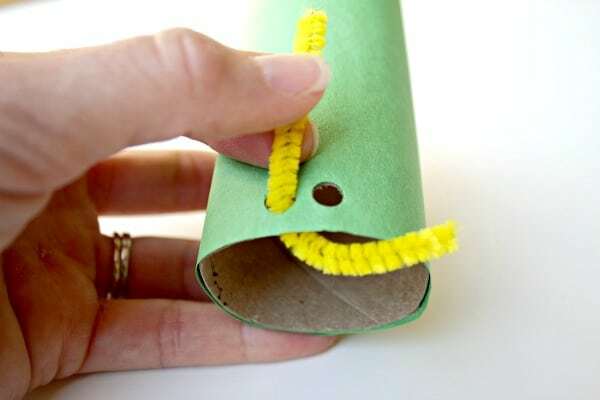 Depending on the age of your children, you may involve them in covering the cardboard tubes to create the pretend caterpillar. You may also choose to have it made ahead of time. 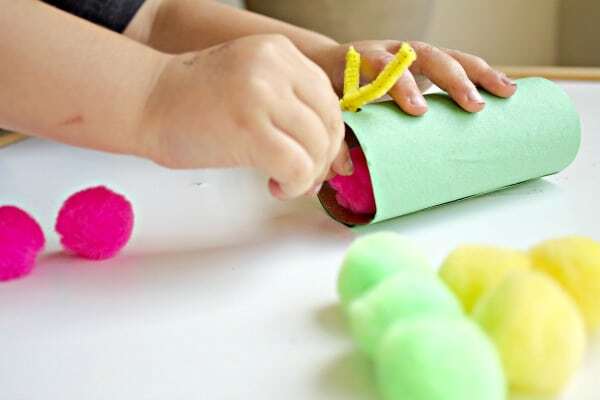 After cutting the construction paper to size and gluing it onto the cardboard tube, we punched two small holes side by side. The small piece of chenille stem was then woven in and twisted to represent the antenna. 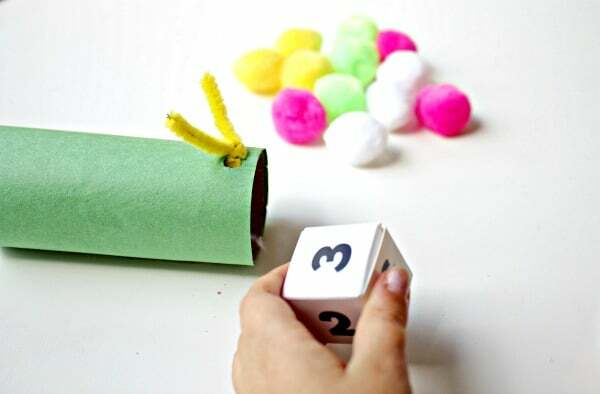 Next, we reviewed the numbers on the die and went over the math activity procedures which included number identification, counting, and then “feeding” the caterpillar the pom poms. 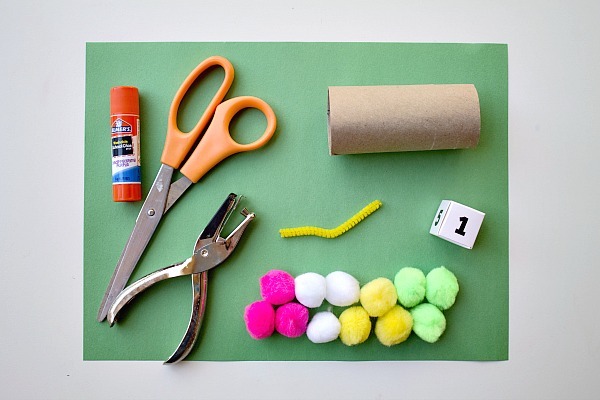 We used a colorful variety of pom poms, but if you check out our caterpillar themed lesson plans, you’ll notice that green is suggested to represent the green leaves they munch on. You may choose to use a numbered dice or a traditional die with dots. We grabbed ours from a board game we had on hand. Rolling the die and watching it plop down turned out to be quite entertaining. The kids were excited to see which number it would land on. 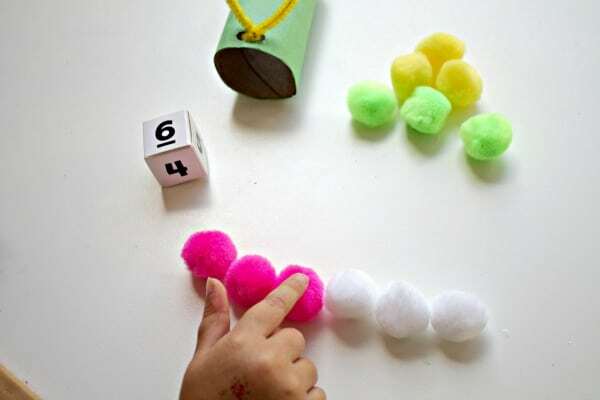 Once the number was identified, some great fine motor skills were applied as small fingers grasped and counted out the correct number of pom poms. Feeding the caterpillar provided another opportunity to count. As each pom pom snack was placed in its mouth, we would count aloud. 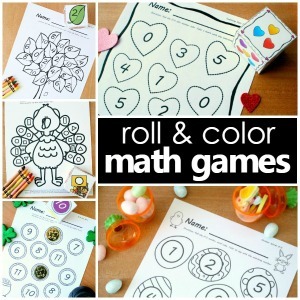 To extend this activity for older children, you may choose to work on addition. 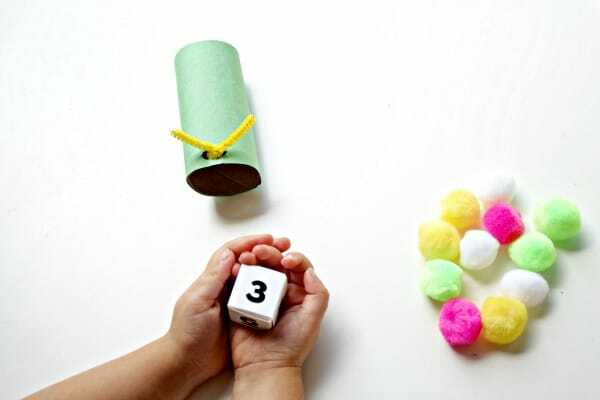 Simply roll the die twice to create two sets of pom poms. We would suggest using separate materials or colors to identify the two groups. Create an addition sentence out of the manipultives, and then feed the hungry caterpillar the sum. We hope you enjoy feeding your caterpillar as much as we did! 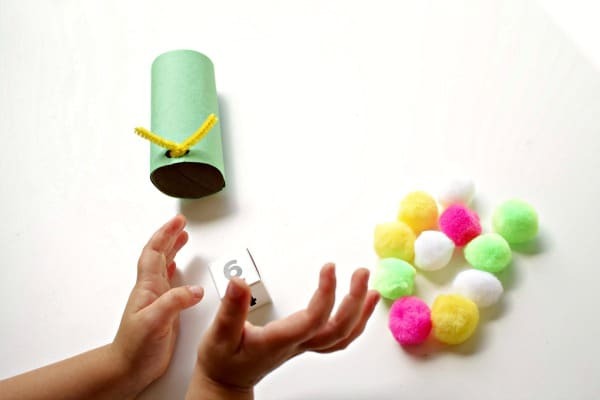 For more caterpillar math fun we also explored a caterpillar counting sensory bin.